Dewdocks are made from polyethylene resin (LLDPE) which is 100% recyclable. Dewdocks will not contaminate our precious waterways and meets the Ministry of Fisheries and Oceans Canada’s standards and guidelines as per that ministry’s Dock Primer publication. The polyethylene resin contains UV-Ray inhibitors to protect against ultra-violet deterioration and offer a balance of toughness, rigidity, environmental stress crack resistance and cold temperature impact performance that ensure a useful life of 35+ years. The floats are rotationally molded for seamless one piece construction with a wall thickness of near 1/4", the toughest on the market. The product is non-leaching, non-toxic, chemical, and petroleum resistant. Dewdock strives to produce a superior product that not only is superior in design, but is environmentally beneficial as well. Dewdock floats contain no expanded polystyrene beads or foam - which when exposed to water can absorb up to 3 lbs. per cubic foot over a seven day period, according to standard testing, and still be approved for flotation! Any float that has been manufactured with foam is destined for landfill from the day it was made, due to the inability to separate the foam from the polyethylene effectively. Our floats can easily be recycled into new products at the end of its lifespan. 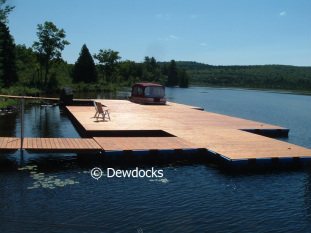 Dewdocks docks, no matter how large, allow light to penetrate between the deck boards to the lake bed below. Another design benefit is the textured float surface promoting aquatic plant life to easily attach itself and grow much the same as with any deadfall or structure in the water, thus adding to the ecosystem. For assembly, stainless steel (SS) bolts are connected through the plastic header blocks (recycled material) into SS T-nuts that are molded in the ties and bumper parts. 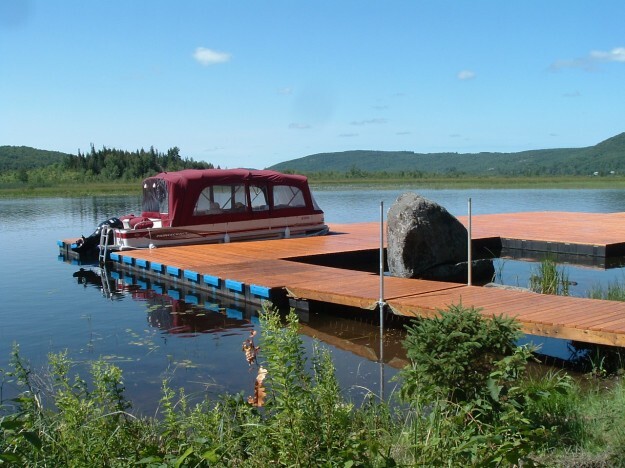 These parts join the floats together forming the flexible frame structure enabling virtually limitless configurations of docks, decks, slips, fingers, wharves, piers and marinas. The header blocks also serve as a connection point to screw the wood header boards to. The top wood deck is then screwed to the header boards completing the main dock. The wood deck remains cool underfoot during the hot summer sun unlike a plastic top float designed as the walking surface. We also offer a full line of hardware to complete all anchor and ramp connection needs. The wood deck remains cool underfoot during the hot summer sun unlike a plastic top float designed as the walking surface. We also offer a full line of hardware to complete all anchor and ramp connection needs.